The low energy precision application (LEPA) irrigation concept was developed primarily to allow irrigators in arid and semi-arid areas to maximize the use of their total water resource and significantly increase irrigation efficiencies. It was particularly targeted to those areas experiencing declines in water availability due to dropping water tables, dwindling surface supplies, or supply decline from other socio-economic reasons. The mechanical component of a LEPA irrigation system is a moving truss system with water conveyance tubes extending from the system mainline to near the soil surface, where correctly sized orifices control deposition of water to individual soil furrows. Irrigation runoff prevention from the furrows as well as rainfall capture is accomplished with soil surface storage enhancement, which is primarily by furrow diking. Other soil manipulation techniques such as deep chiseling for runoff prevention are sometimes applicable for coarse-textured soils. The capture of rainfall by surface storage in addition to irrigation runoff prevention and increased irrigation efficiency combine to enhance the total water resource utilization. Evapotranspiration is also altered since the soil evaporation component is decreased due to alternate furrow application capabilities. Initial irrigation efficiency tests of the LEPA concept involved every furrow LEPA irrigation, which was compared to both graded furrow and sprinkler methods. The tests showed LEPA application, distribution, and water use efficiencies along with energy saving potential were superior to that of furrow and sprinkler delivery systems. Additional tests were initiated to evaluate agronomic yield response to LEPA irrigation under both alternate furrow and every furrow application. In these tests LEPA was compared to drip irrigation on cotton, corn, and soybeans, with irrigation initiation based on soil matric potential. Several years have been devoted to establishing optimum management criteria for LEPA irrigation on different crops. The most extensive study has been on cotton. Additional data continues to be assimilated for other crops. 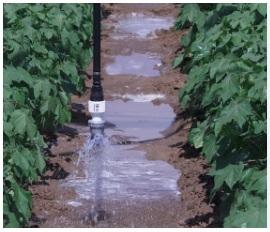 Almost without exception (excluding vegetables), favorable yield responses are obtained from alternate furrow irrigation and are possible only with LEPA if a moving irrigation system is involved. Crops also respond to irrigation frequency and in general more frequent irrigation produces higher yields. This enhances the LEPA irrigation method because it decreases runoff potential. There are also interactions between the quantity of water applied and the frequency with which it is applied on crop yield.